Back in 1995, Ireland’s MedTech and pharmaceutical manufacturing industries were still in the establishment phase. There were some multinationals in the country, but the services supporting these industries that exist today was very small back then. This meant automated production lines were typically brought in from other countries such as Germany and Italy. The founder and Managing Director of Ward Automation, John Ward, knew there was a more efficient way. That involved harnessing the tool-making and engineering skills of the west and north west of Ireland to provide local solutions to multinational companies with an Irish presence. John said: “At that time I was working as an engineer in Abbott and was managing projects bringing in solutions from international companies that were building assembly lines and other equipment. 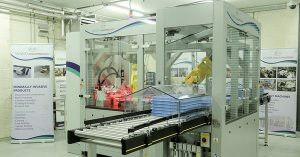 Right from the beginning, Ward Automation established itself as a specialist in providing automated bespoke assembly machines. It focused on regulated industries – medical device and pharmaceutical manufacturing specifically. The company’s expertise includes Factory Automation solutions, Industry 4.0, robotics including cobots, vision systems, and more. It has extensive experience in developing manufacturing solutions for a wide range of MedTech products including minimally invasive catheters and implants. Staying with Ward Automation for the long-term is not something that is unique to its customers, as many of Ward Automation’s employees have also been with the company for many years. In fact, one of the first employees of the company is still a member of the team today. That team services a customer base that is strong in Ireland. In addition, Ward Automation also has a growing export business providing automation solutions to customers in the US, Europe, South America, and elsewhere around the world. To meet its current growth, Ward Automation is in the process of building a new €2.2 million state of the art facility in Sligo. It also recently substantially increased its manufacturing space at its Galway site. The company currently has a total staff of over 50 people that will further increase significantly over the coming months. “Some of the people who now work for the company are members of my family,” said John. “I am proud of the fact we are a family-run business that has a family ethos in a sector that is high tech and that moves at an incredibly fast pace.